We are looking forward to seeing everyone in Reno for AAPP 2019! Our spring newsletter is now available with details about our May 9th AAPP training and many other subjects. Be sure to sign up to receive these newsletters directly to your inbox! Be sure to sign up to receive these newsletters directly to your inbox! Por virtud de lo anterior, Lafayette Instrument Company Inc. desconoce cualesquier operación u oferta de venta, distribución y/o servicio de cualquier tercero diferente y ajeno a la empresa CONSINFO en territorio mexicano. Le invitamos a conocer nuestra página web: https://lafayettepolygraph.com/pages/international-dealers/ en donde podrá encontrar toda la información relativa a los productos de Lafayette Instrument Company Inc., así como la lista de distribuidores autorizados en las diferentes regiones. Finalmente, ponemos a su disposición la siguiente dirección de correo electrónico info@lafayetteinstrument.com y número telefónico +1 765 423 1505 en donde con gusto podemos aclarar sus dudas y proporcionar información sobre nuestros productos disponibles en México a través de nuestro distribuidor exclusivo CONSINFO. Special thanks to Dr. Jaimie Harrow for his work with the Lafayette Hand Held Dynamometer! FALL NEWSLETTER: ARE YOU READY FOR APA? Check out our newsletter about everything going at APA and beyond. If you are going to APA, pick up a ticket to attend one of our two training courses on Thursday, August 30th. Each course is worth 2 hours of CEU training. Tickets are free and seating is limited, so see one of our representatives at the booth to get your ticket! LXSOFTWARE V 11.8 IS HERE! LXSoftware v 11.8 is now available for download in our downloads area! Interview Route Maps are a simple visual aid representing topical coverage of relevant questions. Research has shown that usage of IRMs makes a statistically significant difference in new information and inconclusive results. * Lafayette Instrument online account required for usage of our online guides. Lafayette, Indiana U.S.A, May 17, 2017 - Lafayette Instrument Company will no longer be a Converus Service Partner or provide EyeDetect systems/licenses. "Polygraph is our top priority, our strength, and we know that we will be able to best serve our customers by focusing on their needs and the advancement of polygraph technology." Lafayette is the leading manufacturer of polygraph solutions; with many large-scale projects underway, it is well-positioned to launch the next generation of polygraph instruments, software, and training before the end of the year. In the years to come, Lafayette Instrument will continue to work with customers and partners to enhance and expand the already robust credibility assessment programs that are in operation around the world. We value PEOPLE, INNOVATION, and QUALITY. Lafayette Instrument Company was founded by a gifted young inventor 70 years ago and is now a highly skilled team of Engineers, Developers, Technicians, Support staff, and Production personnel specializing in electronics and instrumentation engineering and manufacturing for polygraph, life science, and human evaluation professionals. It is our mission to develop and deliver industry-leading data acquisition and analysis solutions that advance safety, security, science and medicine. If you would like more information about this update, please contact Jennifer Rider at 1-765-423-1505 or email at info@lafayetteinstrument.com. Lafayette Instrument Company was nominated for Small Business of the Year in Lafayette, IN. Below is a video about our company. Voting is now closed. Thank you to all who voted! In this webinar experts will discuss turnkey solutions, referred to as Bussey-Saksida Systems, in terms of the animal environment, various behavioral Tasks, data analysis, methodology and prescribed best practices. In addition, information on integrating the behavioral Tasks with video tracking, optogenetics and electrophysiology will be discussed. Animal test environments: Turnkey systems with various configurations, hardware and software requirements explained. Behavioral Tasks and their flexibility: Translational to primate and human, broad choice of Tasks for different neuronal targets. Results and interpretation: Data analysis sets included with Tasks. Integration with other systems: Electrophysiology, optogenetics, video tracking. Vision: Benefit the credibility assessment profession and enhance security and safety worldwide. Lafayette Instrument is pleased to announce the official launch of their newest polygraph endeavor. A new training facility, named Peak Credibility Assessment Training Center, is operational, effective immediately. The school is headquartered in Cape Coral, Florida under the guidance and leadership of Director Ben Blalock. Ben has a tremendous following and excellent credentials (Federally trained examiner and interrogator, published author, former military, Masters level education, and experienced teacher and guest lecturer). Tracey Stewart will be the school's Office Manager while continuing to provide polygraph support to Lafayette customers. The first course offered is a Basic Examiner's Course which starts on April 25th, 2016. There are still seats available for this inaugural training class. All varieties of polygraph training will be available including classes hosted at offsite facilities. To learn more about the school, or to register for a class, please visit www.peakcatc.com. Lafayette Instrument will continue its partnerships with existing third-party schools by offering the same high level of support those directors, instructors, and students have come to expect. Dr. Tim Bussey is giving a lecture on "Strategies for cognitive translation from animals to humans: neurogenesis, neurodegenerative and neuropsychiatric disease" for the Collaborative Program in Neuroscience at the University of Toronto on Wednesday, March 30, 2016 at 11:00 AM. For more information about this lecture and the Neuroscience Distinguished Lecture Series, visit the CPIN website. Cambridge University recently published an article on their website about the Bussey-Saksida Touch Screen Chambers. The Vice President of Lafayette Instrument Company's (LIC's) Polygraph Division, Chris Fausett, will be retiring on March 4th, 2016 after 33 years with the company. 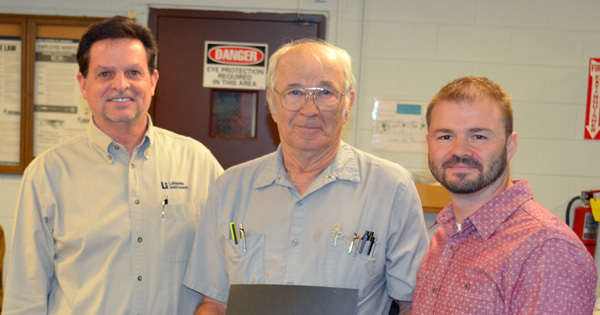 During his tenure, Chris helped to propel the company to the forefront of polygraph instrumentation manufacturing. He gave generously of his time and resources to help educate examiners and bolster the profession as a whole. Chris' commitment is further demonstrated by his curation of dozens of polygraph historical artifacts, many of which are on display at the company's headquarters. With guidance from Chris, Lafayette Instrument company has been able to partner with 43 representatives and dealers, selling to 80 countries around the world. Chris and the management team have a very strong polygraph sales and support group, and they have worked for two years on the succession plan for this division to ensure continuity and quality of service. Chris' successor is Steve Rider. Steve is the son of longtime LIC President, Roger McClellan. Steve joined Lafayette Instrument Company in August 2014 but he has had close ties with the company since Roger purchased it in 1995. Steve is currently the Service, Polygraph Sales, and IT Manager; he will be promoted to Vice President, effective March 7th, 2016. Steve's military background with the United States Marine Corps and his 16 years of technology leadership experience make him the ideal candidate for this position. Both the Lafayette Instrument Company Board and its employees are deeply appreciative of the service which Chris Fausett has given to our company and the community, and we wish him and his family well for the future. Please direct questions to info@lafayetteinstrument.com or call (765) 423-1505. Bussey-Saksida Touch Screen systems made the cover of the December 2015 Learning & Memory. The article is entitled: Deletion mice display cognitive deficits in touchscreen learning and novelty recognition tasks, and it is available in full text! New systems and products prepare LIC and customers for the future. Lafayette, IN, December 30, 2015 - Lafayette Instrument Company (LIC) today announced equipment purchases made in 2015 to improve product quality and operational efficiency. These purchases include a 3D printer for making prototypes and small plastic parts, a flatbed UV LED printer to replace screen printing, and a Vapor Phase Soldering Oven to replace an older model. The 3D printer allows LIC to prototype quickly and iterate on design ideas without waiting on materials or components from third party providers. The new UV LED printer allows greater speed, precision, and variety of printing. The finished product is also very durable. And finally, the new soldering oven is faster, more accurate, and it provides more even temperature distribution. All of the new equipment helps to ensure higher quality products while keeping the cost of manufacturing down. These investments show that while the company is nearly 69 years old, it is still an industry leader in terms of using the best and most current technology available. Additionally, the company has undergone security updates, facility updates and reorganization to prepare for the new year, new customers, and new products as well as providing optimal support for existing customers and products. In the first half of the year, Lafayette Instrument Company introduced Scurry Activity Monitoring Systems for Neuroscience and PI-DAS as a new credibility assessment tool in the Polygraph product line. In the second half of the year, LIC began making improvements to their various websites to make online ordering easier and the mobile experience better. This work will continue into the first half of 2016. New partnerships are also underway to develop custom product solutions, greater distribution of existing products and to bring new products to market in 2016. The executive management team is very pleased to be able to reinvest in the great company in support of its mission to "Deliver robust and effective customer-driven instrumentation and software solutions to enable data collection and analysis." Lafayette, IN - January 1, 2015 - After many years of experience manufacturing the JAMAR Hand Dynamometer for Patterson Medical, Lafayette Instrument Company is honored to unveil our next generation hydraulic hand dynamometer the Lafayette Professional Hand Dynamometer (PHD). The Lafayette PHD is made in the USA, and maintains a standard size and weight while upgrading the gauge to 1% accuracy. Many comparable hand dynamometers on the market provide users with no better than 3% accuracy. 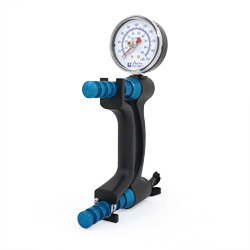 We have also sought to improve the durability of the hand dynamometer, and are proud to say, unlike previous makes and models, we now offer a truly leak-proof hydraulic system. Lafayette will continue to service and calibrate both the Lafayette and JAMAR families of hydraulic hand dynamometer. We also provide a hand dynamometer trade-in program toward a new Lafayette Professional Hand Dynamometer. LAFAYETTE, IN - Lafayette Instrument Company, Inc. is delighted to announce strategic changes to its management team. Jennifer Rider, current Vice President and Chief Information Officer, has been promoted to the position of President and Chief Executive Officer effective January 1st, 2015. Jennifer is a graduate of Purdue University and the National Polygraph Academy and she spent more than a decade in Financial Services technology leadership in Austin, Texas prior to joining Lafayette Instrument in February 2012. Terry Echard, President and General Manager of Lafayette Instrument, will continue to provide leadership at Lafayette Instrument as the Vice President and General Manager of the Life Sciences division. Terry has been with Lafayette Instrument since 1989 and has served the company in various capacities given his depth of expertise and versatility. We are grateful to have had Terry at the helm during the last two years; he helped ensure continuity and success following the loss of our former President, Roger McClellan. Finally, Chris Fausett will continue as our Vice President and General Manager of the Polygraph division. Chris has been with Lafayette Instrument for 32 years and, like Terry, has served in numerous roles and has extensive experience in all aspects of Lafayette Instrument’s business. Jennifer, Terry and Chris are partners, and alongside Lora McClellan, they serve on Lafayette Instrument’s Board of Directors. We are excited about the updates to our management team. We believe that these changes will allow Lafayette Instrument to continue to provide quality products and service to our customers and to continue to be a leader in the polygraph and life sciences industries. Buffalo News details preparation for Super Bowl at MetLife Stadium. Download 01128 Skinfold Caliper Comparison Study from our website!